1.1 How to Get Rs.100 Off on No Minimum Order Value? Flipkart Bus Ticket Offer, Flipkart Travel Offers, Flipkart Offers Today, Flipkart Bus Ticket Promo Code, Flipkart Bus Ticket Coupons – Hello Coolzdeals Readers, Hello Coolzdeals Readers, We hope You are Enjoying Free Flipkart Plus Subscription, Flipkart Free Vouchers, Flipkart Free Recharge and many more. Subscribe to Our Coolzdeals Telegram Channel For Latest Loot Deals from Amazon and Flipkart. Flipkart is Back with Another Loot. They gave Free Recharge when they Launched Wallet. Now, Flipkart is Giving Rs.100 Off on No Minimum Order. So Book Bus Ticket and Pay with Debit or Credit Card to Get Direct Discount. The Offer is Live till 31st March Only. How to Get Rs.100 Off on No Minimum Order Value? 1, Download Flipkart App from Play Store. 2. Go to Dashboard and then, Flipkart Travel. 3. Now, Go to Bus Booking. 4. Do a Bus Booking, Choose City and Destination with Date. 5. Now, Pay with Debit or Credit Card, After Adding Debit Card, You will see Rs.100 Discount Automatically. 6. Done. You got Rs.100 Off on No Minimum Order Value. The offer, (Flat Rs.100 Instant off on Bus Tickets), is valid on Bus Bookings are done via the Flipkart Travel Platform, powered by MakeMyTrip Pvt Ltd.
27th March 2019, (00:00) hours to 31st March 2019, (23:59) hours. Is the offer applicable on all Transactions? Will I get the offer if I pay using a Bank Debit, Credit Card and Net Banking via PhonePe? No, the offer will not apply on payments made from via PhonePe payment option. The offer can be availed by a customer only twice during the offer period. 1. 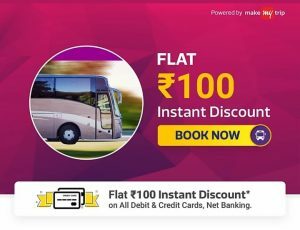 This offer ( Flat Rs.100 Instant off on Bus Tickets ) is being run by MakeMyTrip Pvt Ltd (MMT) on www.flipkart.com, Flipkart mobile app and Flipkart mobile site (collectively Platform), which Platform is owned and operated by Flipkart Internet Private Limited (Flipkart, We or Our). It is open to all residents of India holding a valid and current Credit & Debit Card, Net banking facility (instrument holder and Card).